"It's bath time? Oh, no! iiyak nanaman si baby niyan!" As a new mom, you have to admit it. You were sweating, panicking, and did not know what to do the first time you decided to bathe your baby. But you have no choice because your baby is already smelling like a spoiled milk and he/she is already having those nasty red dots all over. I remember wanting to bathe Arya alone when we got home from the hospital but I was so afraid that I might hurt her. I mean seriously, I don't know anything about bathing a baby. I only bathed a cat, and let's just stick with that. Not! Arya hated the water. The moment she got in the tub, she will automatically cry. She will just cry and cry and we ended up not being able to wash the soap residue because she won't stop crying until she's out of the tub! Luckily, after a few tries of doing a LOT of things to calm her down, we finally succeed! Sharing with you my own personal tips on how you can bathe your baby with him or her smiling at you while you scrub those libag away. Feeding. You have to make sure that your baby is full before bathing her. That way, you eliminate a reason why she will became fussy while in the tub. We usually bathe her 30 minutes after she feed regardless of the time of the day. But, if you may ask, we bathe her between 10:30 am - 3:00 pm. Burping. You don't want baby who hiccups while in the tub. It adds up to your baby being fussy and distracted. We burp Arya before and after feeding. Just making sure she's air free in her tummy. Pooping. If you have a baby who has a regular pooping schedule, chances are that she or he will have a wonderful time in the tub. Arya used to poop in the morning all the time and we can see how happy and relaxed she is at bath time after every poop. Water. Always check the temperature of the water. Babies' body temperature is very unstable. What's mild to you may still be hot to them. Make sure you have a towel ready to wrap to your baby as soon as you pick them out of the tub. Oh, and turn off the fan or ac while you're at it. Singing. Make a sound. Any sound. It doesn't matter if you just blabber or sing a piece from Sinatra. 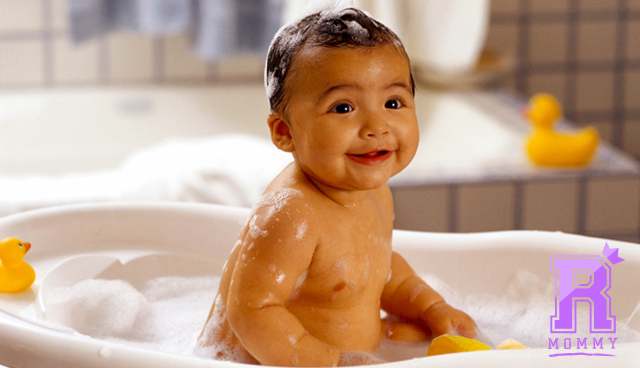 Babies love it when you are talking to them while bathing. It's a good distraction for them as well. Do not panic. Easy to say than done. Just calm down. Babies can sense if you are tense and they will become tense too. Just relax and smile to your baby. Rinse. Lastly, no matter how loudly your baby cries, you have to make sure that you rinsed them properly. You don't want those residues stuck to your baby's skin because they will turn into these nasty rashes. And that's a lot harder to solve. And costly too! Little Arya having her bath. There you go! I hope my tips will help you out. It will take a lot of practice and a few tries to turn your baby's cries into smiles but I'm sure that you'll eventually get there. Rookie Mommy PH - Now loves bath time!